3.1.1 Is J1-P58 the main Arabic haplogroup? The first J1 men lived in the Late Upper Paleolithic, shortly before the end of the last Ice Age. The oldest identified J1 sample to date comes from Satsurblia cave (c. 13200 BCE) in Georgia (Jones et al. (2015)), placing the origins of haplogroup J1 in all likelihood in the region around the Caucasus, Zagros, Taurus and eastern Anatolia during the Upper Paleolithic. Like many other successful lineages from the Middle East, J1 is thought to have undergone a major population expansion during the Neolithic period. Chiaroni et al. (2010) found that the greatest genetic diversity of J1 haplotypes was found in eastern Anatolia, near Lake Van in central Kurdistan. Eastern Anatolia and the Zagros mountains are the region where goats and sheep were first domesticated, some 11,000 years ago. Chiaroni et al. estimated that J1-P58 started expanding 9,000 to 10,000 years ago as pastoralists from the Fertile Crescent. Although they did not analyze the other branches, it is likely that all surviving J1a1b (L136) lineages share the same origin as goat and sheep herders from the Taurus and Zagros mountains. The mountainous terrain of the Caucasus, Anatolia and modern Iran, which wasn't suitable for early cereal farming, was an ideal ground for goat and sheep herding and catalyzed the propagation of J1 pastoralists. Having colonised most of Anatolia, J1 herders would have settled the mountainous regions of Europe, including the southern Balkans, the Carpathians, central and southern Italy (Apennines, Sicily, Sardinia), southern France (especially Auvergne), and most of the Iberian peninsula. Hotspots of J1 in northern Spain (Cantabria, Asturias) appear to be essentially lineages descended from these Southwest Asian Neolithic herders. Most J1 Europeans belong to the J1-Z1828 branch, which is also found in Anatolia and the Caucasus, but not in Arabic countries. The Z1842 subclade of Z1828 is the most common variety of J1 in Armenia and Georgia. There are also two other minor European branches: J1-Z2223, which has been found in Anatolia and Western Europe, and J1-M365.1, also found a bit everywhere across Western Europe. Their very upstream position in the phylogenetic tree and their scarcity in the Middle East suggests that these were among the earliest J1 lineages to leave the Middle East, perhaps as Late Paleolithic or Mesolithic hunter-gatherers that wandered outside Anatolia and, pushed by successive waves of migrations from the Neolithic to the Bronze Age, ended up in Western Europe. Within the Middle East, SNP analysis shows that the J1-L136 branch migrated south from eastern Anatolia and split in four directions: Anatolia/Europe (PF7263), the Levant, the southern Zagros (and southern Mesopotamia ? ), and the mountainous south-western corner of the Arabian peninsula (mostly in Yemen), bypassing the Arabian Desert. That latter group, consisting essentially of J1-P56 lineages, crossed the Red Sea to settle Sudan, Eritrea, Djibouti and northern Somalia. The climate would have been considerably less arid than today during the Neolithic period, allowing for a relatively easy transmigration across the Middle East with herds of goats. Neolithic J1 goat herders were almost certainly not homogenous tribes consisting exclusively of J1 lineages, but in all likelihood a blend of J1 and T1 lineages. So much is evident from the presence of both J1 and T1 in north-east Africa, Yemen, Saudi Arabia, but also in the Fertile Crescent, the Caucasus and the mountainous parts of southern Europe. Maternal lineages also correlate. Wherever J1 and T1 are found in high frequency, mtDNA haplogroups HV, N1 and U3 are also present, as well as J, K and T to a lower extent (=>see Correlating the mtDNA haplogroups of the original Y-haplogroup J1 and T1 herders). It is unclear whether goats were domesticated by a tribe that already comprised both J1 and T1 lineages, or if the merger between the two groups happened during the Neolithic expansion, when two separate tribes would have bumped into each others, intermixed, and thereafter propagated together. Kitchen et al. (2009) estimated through a Bayesian phylogenetic analysis that Semitic languages originated in the Levant around 3,750 BCE, during the Early Bronze Age. It evolved into three groups: East Semitic (an extinct branch that comprised Akkadian), Central Semitic (which gave rise to Aramaic, Ugaritic, Phoenician, Hebrew and Arabic), and South Semitic (South Arabian and Ethiopian). J1-P58, the Central Semitic branch of J1, appears to have expanded from the southern Levant (Israel, Palestine, Jordan) across the Arabian peninsula during the Bronze Age, from approximately 3,500 to 2,500 BCE. Camels were domesticated in Somalia and southern Arabia c. 3,000 BCE, but did not become widely used in the southern Levant before approximately 1,100 BCE. Camels played an important role in the further diffusion of J1-P58 lineages, notably with the Bedouins in the desertic parts of the Middle East and North Africa. Bedouins now make up a substantial percentage of the population of Sudan (33%), Libya (15%), the United Arab Emirates (8%) and Saudi Arabia (5%). The two most common Jewish subclades of J1 downstream of P58 are Z18297 and ZS227. The latter includes the Cohanim haplotype. Most of the other branches under P58 could be described as Semitic, although only FGC12 seems to be genuinely linked to the medieval Arabic expansion from Saudi Arabia. Based on very limited data, the main Lebanese subclades of J1 appear to be J1-Z640 and J1-YSC76. Both subclades have also been found in Sicily, Andalusia and Portugal, which suggests that they were already found among the Phoenicians. However, since the Arabs conquered the same regions as those colonised by the Phoenicians, it is too early to reach such a conclusion. Subclades found in Sardinia are very useful as practically all J1-P58 on the island were supposedly brought by the Phoenicians. They include Z18297 (could also be Jewish), Z2324>YP4763, YSC76>FGC15940>ZS1690 and YSC76>FGC8223>FGC8216>FGC8196. Frequencies of haplogroup J1 in Europe and West Asia tend to vary considerably from one regional community to the next. The highest local percentages in Europe are found in Greece, Italy, France, Spain and Portugal and hardly ever exceed 5% of the population. However Italy, France and Spain also have areas where J1 appears completely absent. Even in northern Europe, where the nation-wide frequencies are below 0.5%, very localised pockets of J1 have been observed in Scotland, England, Belgium, Germany and Poland. Larger sample sizes are needed to get a clearer picture of the distribution of J1 in Europe. Surprisingly, even in the Caucasus and in Anatolia, the region where this haplogroup is thought to have originated, there are wide discrepancies between regions. For example, the Kubachi and Dargins from Dagestan in the Northeast Caucasus have over 80% of J1 lineages, while in their Ingush neighbours, 200 km to the north, it barely reaches 3%. East Anatolia around Lake Van sees over 30% of J1, whereas south-west Anatolia has only 2%. Even within Kurdistan frequencies vary greatly. The small sample sizes for each region is surely to blame. In Arabic countries, J1 climaxes among the Marsh Arabs of South Iraq (81%), the Sudanese Arabs (73%), the Yemeni (72%), the Bedouins (63%), the Qatari (58%), the Saudi (40%), the Omani (38%) and the Palestinian Arabs (38%). High percentages are also observed in the United Arab Emirates (35%), coastal Algeria (35%), Jordan (31%), Syria (30%), Tunisia (30%), Egypt (21%) and Lebanon (20%). Most of the Arabic J1 belongs to the J1-P858 variety. The above phylogenetic tree was is based on the data from Yfull.com, but using the Family Tree DNA nomenclature whenever possible. Main subclades are highlighted in green. J1 can be divided in two main groups: the very large J1-P58 subclade, and the other branches of J1. J1-P58 (J1a2b on the ISOGG tree, formerly known as J1e, then as J1c3) is by far the most widespread subclade of J1. It is a typically Semitic haplogroup, making up most of the population of the Arabian peninsula, where it accounts for approximately 40% to 75% of male lineages. J1-P58 is thought to have expanded from eastern Anatolia and the southern Caucasus to the Taurus and Zagros mountains, then Mesopotamia, and eventually the Arabian peninsula at the end of the last Ice Age (12,000 years ago) with the seasonal migrations of goat and sheep pastoralists. It is during the Neolithic that subclades like L860 and L93 would have reached the mountainous parts of the southern Arabian peninsula (Yemen, Oman), whereas L816 and L862 remained in the Fertile Crescent. Arabic speakers recolonised the Arabian peninsula in the Bronze Age from the north-west of the peninsula, close to present-day Jordan. The rise of Islam in the 7th century CE played a major part in the re-expansion of J1 from Arabia throughout the Middle East, as well as to North Africa, and to a lower extent to Sicily, Spain and Portugal. The numerous subclades downstream of L858 represent the expansion of Semitic languages, such as Akkadian, Ugaritic, Phoenician, Aramaic and Hebrew. Only the FGC12 subclade is linked to the propagation of Islam and the Arabic language from Saudi Arabia from the 7th century CE. Yet even this subclade is shared by the Bedouins and a minority of Jews. About 20% of Jewish people belong haplogroup J1-P58, most of whom are also positive either for ZS227, L858 (Z642, YSC76 and FGC12) or Z18297. L816 represents a minority of Jewish J1. ZS227 comprises the Cohen Modal Haplotype. In the Hebrew Bible, the common ancestor of all Cohens is identified as Aaron, the brother of Moses. Roughly half of all Cohanim belong to J1-ZS227. The Cohanim haplotype (YCAII=22-22) of ZS227 matches the Z18271 deep clade. J1-YSC234 (aka Z2313 or Z2329) was found in a pre-Ptolemaic Egyptian mummy dating from c. 660 BCE (Schuenemann et al. (2017)). This clade developped about 5,800 years old, which is about the same age as the first Semitic languages. The mummy is much more recent though, but it proves that J1-YSC234 was present in Egypt long before the Arabic expansion, and therefore that this lineage can be seen as more widely Semitic. All three branches of J1-L858 (S640, YSC76 and FGC11) are found in Europe, principally in Spain, Italy, central and eastern Europe. Their relatively recent time of divergence with their Middle Eastern cousins (Late Bronze Age to Iron Age) suggests that they would have arrived with the Phoenicians (Sicily, Sardinia, Spain), and later in greater numbers with the Jewish diaspora. Spain and Portugal have the highest percentage of FGC12 in Europe, but this amounts to about 12% of J1 lineages, i.e. less than 0.5% of the population, suggesting that the Arabs had a much smaller genetic impact on the Iberian population than the Jews and the Phoenicians. Erythrean, Ethiopian, Somali and Sudanese people possess various subclades of J1, but especially J1-P56, which probably arrived during the Neolithic, and the Arabic J1-FGC12, which brought Islam to the region. For men who tested their Y-DNA with companies such as Family Tree DNA, iGenea or Genebase, certain subclades can be easily identified by specific STR markers. J1-L93 (aka L92.1) and J1-L386 are both defined by DYS446=13. L93 has a DYS641 value smaller or equal to 10. L386 can be identified by YCAIIa=17. L93 is retricted to Saudi Arabia, Yemen and Oman, while L386 was found chiefly the United Arab Emirates. J1-Z640 (aka Z641 or Z644) is particularly common in Syria and Lebanon, but also has been found also in Turkey, Israel and in the Arabian peninsula, as well as well as in many European countries, particularly Spain. It was very probably found among the ancient Phoenicians. Z640+ members typically have DYS561=14. Its subclade L174.1 can be identifed by the STR value DYS594=11. J1-L817 is a major Jewish cluster, also defined by L818 and DYS392=13. It has been found a far as China. Most Jewish members belong to its subclade L816. J1-L823 (under FGC15940) corresponds to DYS452=30. It is is a Jewish cluster found mostly in central and eastern Europe, but also in Spain. J1-L1253 corresponds to DYS557>18. It appears to be limited to Britain and Ireland. J1-L1279 corresponds to DYS497=16. A rare subclade identified in the United Arab Emirates. J1-L444 is a small Arabic subclade defined by DYS531=12. Both L615 (found in the United Arab Emirates) and L859 (found in Iraq and Saudi Arabia) share an STR value for DYS485 around 14. Is J1-P58 the main Arabic paternal lineage? Looking at the map of J1-P58, it is easy to assume that P58 is a marker of Arabic ancestry because it reaches its maximum frequency in and around the Arabian peninsula. That would be an oversimplification. It is important to make a clear distinction between people who speak Arabic and those who are genetically Arabic. These are two completely different things. For comparison, people who speak languages descended from Latin (French, Spanish, Portuguese, Italian, Romanian) are not necessarily descended from the ancient Romans of the Latium. Even those who do may not have more than a tiny fraction of their genome which was inherited from actual Roman ancestors. This is why most Romance-language speakers today cannot be considered as genetically Roman. Most present-day Arabic speakers outside the Arabian Peninsula are likewise only very partially or not all Arabic genetically. In the northern half of the Middle East, most of the people who call themselves Arabs of today are in fact mainly descendants of other historic peoples, such as the Phoenicians, Assyrians, Babylonians, or even the Hurrians. Most of these peoples are predominantly J2, with many minority haplogroups (E1b1b, G, J1, L, Q, R1a, R1b, T). The confusion comes from the fact that the Arabic language, which appeared a little more than 1,500 years ago, is much more recent than the haplogroup J1 (31,000 years old) or even the P58 subclade (14,000 years old). Even the J1-L858 subclade (5,000 years old), associated with Southwest Asian people, very clearly predates the Arabic language. The common ancestor of the J1-L858 men alive today dates back to approximately 4500 years ago, a time that corresponds to the development of the the oldest Semitic languages, like Akkadian and Amorite. In fact, L858 is not specific to the Arabian peninsula, but is also found among the Jews (especially Z640 subclade), Lebanese, Syrians and Iraqi, among others. In other words L858 cover all the region where ancient Semitic languages were spoken, well before Arabic even existed. That is why L858 should be seen as more widely Semitic and not just Arabic, even if the many Levantines and Mesopotamians were later Arabicised. The Jews are of the these Semitic people who were not Arabicised, and hardly anyone would argue that Jews are Arabs genetically, or vice versa. The true lineage of the historic Arab people (so mainly from Jordan and Saudi Arabia) is J1-FGC12 (aka S21237). This subclade started expanding in the Arabian peninsula a bit over 3,000 years ago and did experience a tremedous expansion in the last 1,300 years, as can be seen in the completely phylogenetic tree on Yfull.com. Nowadays these more genuinely Arabic J1-FGC12 lineages are found throughout the Arabic-speaking world, but they only represent a small minority of lineages in any region but the Arabian peninsula. The other subclades of J1 cannot be considered to be the paternal descendants of first speakers of Arabic. These other J1 lineages were Arabicized alongside other haplogroups (J2, Q1b, etc.) during the Islamic expansion from the 7th century onward. More importantly, J1-FGC12 is not the only haplogroup that spread with the Arabic expansion linked to the diffusion of Islam. Nowadays only 40% of Saudis and 30% of Jordanians belong to J1 (most but not all to FGC12). E1b1b-M34 is another important Arabic lineage, being found in 25% of Jordanians and 10% of Saudis. Like J1-P58, E-M34 it is also shared with their Semitic cousins, the Jews. Haplogroup E1b1b is considered the prime candidate for the origin and dispersal of Afro-Asiatic languages across northern and eastern Africa and south-west Asia. The Semitic languages appear to have originated within a subclade of the M34 branch of E1b1b. One specific deeper subclade is surely associated with the development of Arabic language and with J1-FGC12, but it hasn't been identified yet. Note that E-M34 itself is many thousands of years old and is also found in non-Semitic countries, including Turkey, Greece, Italy, France and Spain. Most of the J1 in the Caucasus, Anatolia and Europe is of the non-J1-P58 variety. These branches diverged from one another during the Ice Age and have nothing to do with Semitic people. In fact the origins of J1 lie around the Caucasus, which explains that all branches other than P58 are most common in that region, as well as in Anatolia and Europe. J1a1 (M365.1) has been only found in very low frequencies in Western Europe (Western Iberia, French Pyrenees, Belgium and England), in northern Iran and Qatar. It may have come to Europe during the Mesolithic period, or as a very minor Neolithic lineage. J1a1b1 (P56) is a minor Arabic cluster found on the Red Sea coast of Saudi Arabia, Yemen and Ethiopia. It can be identified by the STR value DYS641=11. J1a2a (Z1828) is defined by the STR values DYS436=11 and DYS388<15. It is the second most common top level subclade after J1-P58. It is particularly frequent around the Taurus and Zagros mountains and all over the Caucasus region, but has also been found at low frequencies in western Turkey, Greece, Ukraine, South Italy, Central Europe, France, and the British Isles. The L1189 subclade seems to be mostly northern European (+ a few samples in Greece and the Arabian peninsula). Under Z1842, the CTS1460 subclade is geographically restricted to the Caucasus, Zagros and Taurus, while ZS3089 is found mainly around Armenia and Azerbaijan. L1189 and Z1842 could have been minor lineages accompanying the main Neolithic haplogroup G2a. That would explain their very wide geographic distribution and low frequency outside their region of origin. 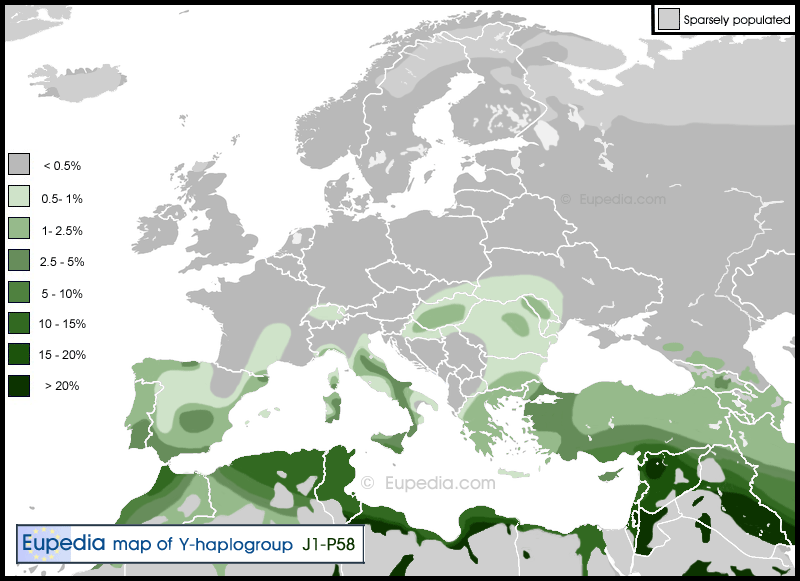 Like haplogroup G2a, J1 might have been of the principal lineages to bring domesticated animals to Europe. Both G2a and J1 reach their maximal frequencies in the Caucasus, some ethnic groups being almost exclusively J1 (Kubachis, Kaitaks, Dargins, Avars), while others have extremely high levels of G2a (Shapsugs, North Ossetians). Most of the ethnic groups in the North Caucasus have between 20 and 40% of each haplogroup, which are by far their two dominant haplogroups. In the South Caucasus (Georgia, Armenia, Azerbaijan), haplogroup J2 comes into the admixture and is in fact slightly higher than either J1 or G2a. Armenia stands out of the lot by having a substantial J1-L147.1 (L862) minority (at least one third of all J1, i.e. roughly 4% of the population). J1b (F1614, Z2223) arose soon after the Last Glacial Maximum (c. 26,500 to 19,000 years before present). It is likely to have spread from the Caucasus to Europe and Anatolia during the Paleolithic and Mesolithic periods. J1-Z2223 matches the STR value DYS446=12. It has been found in Egypt, Anatolia, Italy, Spain, Germany, Belgium and in the British Isles. J1b members negative for Z2223 were found in Finland, Oman and India. Alan Dershowitz (b. 1938): is an American lawyer, jurist, and author. He is a prominent scholar on United States constitutional law and criminal law, and a leading defender of civil liberties. In 1967, at the age of 28, he became the youngest full professor of law in the history of Harvard University. His haplogroup was hinted in the PBS TV series Finding Your Roots. Bennett Greenspan (b. 1952): genetic genealogy pioneer and founder of Family Tree DNA, the first American company to offer genealogical DNA testing directly to the general public. He belongs to J1-L823.